In an amazing story of marvellous multiples, a first-time Chinese mum has delivered a baby boy, followed by two girls… a whopping six days later. Mrs Chen, who is reportedly in her 30s, hails from Yichang City, in Hubei Province. She married her husband back in 2012, seeking fertility treatment in 2016 when the couple’s efforts to have a family sadly proved fruitless. The Eastern China News Service (ECNS) reports that Mrs Chen naturally birthed her first bub – a 1.44kg baby boy at the First Hospital of Yichang, at around 2pm on February 21, 2017. Her contractions promptly ceased, leading her obstetrician – a Dr Chen Aihua – to suggest continuing with the pregnancy as usual, until the remaining babies were ready to make an appearance. Mrs Chen subsequently delivered the two girls, also naturally, at 10pm on February 27. A full six days after their early bird brother. The excited new mum appeared a little bit intimidated by her suddenly substantial family. “I dreamed of having a child when I was not able to get pregnant,” she told ECNS. 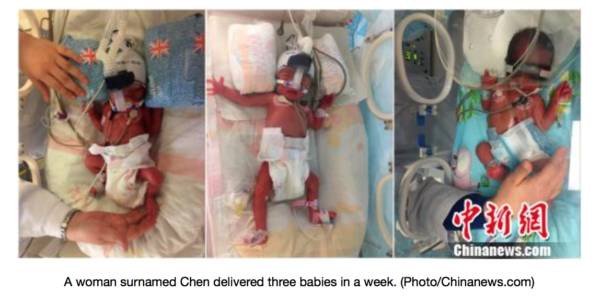 Obstetrician Dr Aihua said the twins, born almost a week apart, were the first such case of delayed interval delivery (where multiples are born at different times) she’d ever treated. She revealed the babies were dizygotic – or fraternal – triplets. These multiples occur when more than one fertilised egg becomes an embryo. Baby number one – the early bird son – grew in his own amniotic sac, and the two girls grew together in another sac. The babies are currently in special care, due to their low birth weights and very early arrival. We’re wishing this family happy, healthy babies as soon as possible.